Love Parade 2k6 from the Tiesto Truck. Test Your Popup Blocker Software. Beginning with the version shipped with XP SP2, Internet Explorer includes a tool that can eliminate most pop-up windows. With this feature turned on, you’ll be spared the annoyance of advertising that appears unbidden in windows lying either over or under the Web sites you visit. Pop-up Blocker is turned on by default. To determine or change its status, choose Tools, Pop-up Blocker. If the feature is on, the Pop-up Blocker submenu displays a command to turn it off – & vice versa. PopupTest.com provides a simple and independent source for popup window testing. Whether you are developing a popup killer software or you are thinking about purchasing one, you can use our sample popups to test the effectiveness of the application. We are providing samples of the most common popup styles, as well as some not so common ones (as indicated). XP Folder Option: Managing Pairs of Web Pages and Folders. 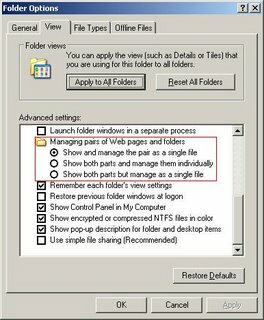 The View tab of the Folder Options dialog box, offers a potpourri of advanced options that govern various aspects of Windows Explorer’s behavior. Some of these are self-explanatory & relatively inconsequential. Others are less obvious & can have a significant impact on how you work in XP. One such setting is the “Managing Pairs of Web Pages and Folders “option . If you save a Web page using IE’s Web Page, Complete option (choose Web Page, Complete (*.htm, *.html) in the Save As Type list), where IE saves the Web page’s text in one file & puts all the associated graphics & other supporting docs in a folder with the same name. E.g. if you save the Microsoft home page (http://www.microsoft.com/homepage/ms.htm) under its default name, Microsoft Corporation, you will get a file named Microsoft Corporation.htm and a folder called Microsoft Corporation_files. The folder contains the various image, style sheet, & script files that support the HTML file. By default, Windows Explorer links such file-and-folder pairs. The file & folder are shown as separate items, but actions taken upon one are applied to both. Delete or move either the file or the folder, for example, & Windows Explorer moves or deletes both items. This behavior makes it less likely that you’ll “break” a saved Web page by separating its component parts. Keeping the file and folder linked is generally a good idea. But you can sever the link for a particular file-folder pair by renaming either the file or the folder & answering a confirmation prompt. You can also prevent Windows Explorer from linking the file and folder in the first place by choosing Show Both Parts And Manage Them Individually in the Advanced Settings list. Note that this section of the Folder Options dialog box offers two alternatives: Show And Manage The Pair As A Single File, and Show Both Parts But Manage As A Single File. The difference between the two? Nothing. The first of these alternatives should hide the supporting folder, but it does not. Perhaps a future version of Windows will eliminate this bug. 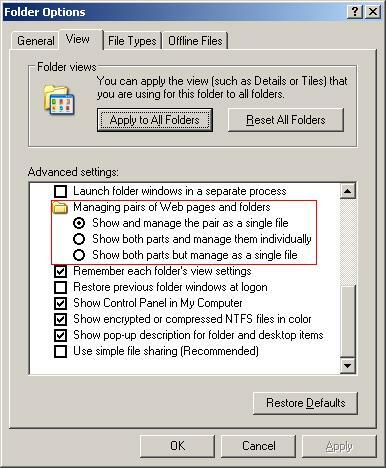 If you find cannot find the “Managing pairs of Web pages and folders” within your open Folder Options, it could be because this option is not a standard component of Windows XP, but added by Microsoft Office XP/2003 setup. This option can still be added by downloading and running the following REG file. Hurling Bike off a Bridge Prank. They say you should keep your friends close and your enemies closer. This guy should do neither – his friends obviously despise him, as one of them proves by hurling his bike off a bridge, while the other one chuckles to himself whilst casually filming the whole twisted prank. Microsoft to show ‘iPod killer’ today? Microsoft will reportedly announce its own iPod killer gadget, Zune, today. A report claims the device announcement is scheduled for this morning. The device is expected to ship later this autumn. Microsoft also plans to emulate Apple’s end-to-end business model with the announcement of its very own music download service, which uses Microsoft’s own DRM (digital rights management) system. However, Microsoft isn’t infallible. A recently disclosed vulnerability in its DRM system hasn’t yet been repaired (as of 9pm yesterday), leading giant UK satellite broadcaster, Sky, to temporarily shut down its broadband-based movie download service. Microsoft has pledged to invest millions in the coming years in its attempt to take on the iPod’s market lead. Throughout its history, Microsoft has exploited its PC market lead and deep pockets to attempt to dominate every technology area it plays in, often running foul of local antitrust regulators as it attempts to imprint its DNA on these myriad sectors. Apple announced new higher-capacity iPods, new nanos, new shuffles and iTunes 7.0 (with movie download service and games) this week. It also explained a new device designed to let users stream movies effortlessly from their computer to a TV. Foods That Build Muscle Fast. For more than a year, I’ve been writing about my cooking and eating habits in the “Muscle Chow” column. I used to get asked about exercises. Now it’s questions like “Did you ever cheat, or have you always eaten perfectly?” Well, sure I’ve cheated. How would I know what good eating is if I’d never eaten badly? I had a healthy start, though. Growing up, we never had cookies in the house, we never snacked on chips or sugary cereals, and soda wasn’t allowed past the front door. My parents introduced tons of healthy foods into my life–and I’m doing the same for my kids. I never knew our family was different until I saw the cookie jar on the counter one day at my grade-school friend Vince’s house. “You mean you can take a cookie whenever you want?” And yes, I headed for that cookie jar every time I went to Vince’s. My parents’ strict approach to food meant I could afford–and savor–such a treat. When I began training and competing in bodybuilding contests, I realized that my diet was my best edge on the competition. Over the years, I’ve learned which foods accelerate or slow my gains. I think the right nutritional strategy can help any man build the body he wants. But, as I’ve said, that’s only the first question. There are plenty more, like the ones on these pages, which I’ve received through MensHealth.com since I started writing the column. So here are my answers–everything you need to know about creating a model meal plan. Is there a secret to your meal plan? My diet revolves around protein intake. It’s the touchstone that determines how many carbohydrates I’ll eat in a given meal or snack. I average out my meals and snacks over the course of a day, but the final percentages I like to hit are about 35 percent protein, 55 percent carbs, and 10 percent fat. I stick to white-meat animal proteins like chicken (canned or regular), fish (including canned tuna and sardines), turkey breast, shrimp, oysters, and lobster. Chicken, fish, and turkey probably make up 50 percent of my daily protein. I rotate the rest about once every 10 days. Other protein mainstays include whey-protein powders, eggs (mostly egg whites), yogurt, cottage cheese, and unsalted nuts. Does the rest of your family eat what you eat? It’s funny how many people ask what my kids eat. Readers must think I’m this tyrant who’s force-feeding his children carrot juice, spinach salads, and unsweetened oatmeal. I just want my kids to have an understanding of which foods are good for them and which ones aren’t the best choices. In the end, my wife and kids pretty much eat what I eat. And the kids eat at McDonald’s once in a while. It’s like me with Vince’s cookie jar–as long as they’re eating healthfully most of the time, an occasional fast-food burger won’t hurt them. What do you have lying around the kitchen for a quick snack? There’s fruit everywhere. On the counter, I keep apples, pears, peaches, nectarines, oranges (I live in Miami), apricots, bananas, and whatever else is in season. (I try to buy organic.) In the fridge, cantaloupe, watermelon, berries, and grapes. There’s nothing wrong with impulsively munching on any of these. What’s a typical weeknight dinner for you? It’s always simple–that’s the key to consistently eating well. Poached salmon with steamed vegetables is about as easy to make as a peanut-butter-and-jelly sandwich, and it’s a fast way to get protein, creatine, essential fatty acids, glutamine, and phytonutrients into your diet. This kind of meal is easy and offers a nice, balanced nutritional profile. Remember to keep an eye on your portions, using your palm as a simple gauge to measure a single serving. One palm for protein, two palms for vegetables, one palm for a starch, and you have a nice, balanced meal. Put the salmon fillet, celery, and lemon pepper in a pot filled with just enough water to cover the fish completely. (Don’t fill the pot more than you have to.) Bring the water to a slow boil and let it continue for about 10 minutes, or until the thickest part of the fish is done. Using a spatula, remove the salmon, gently turn it over, and scrape the skin from the underside. At the same time in a separate pot, steam some mixed vegetables. I use a metal steamer that sits at the bottom of the pot. Just fill it with about an inch of water, drop in the vegetables, bring the water to a boil, and cover the pot for 3 to 5 minutes. Here’s another easy dish I do on the fly. I make enough for two meals and store the leftovers in the fridge. In a skillet over medium heat, cook the onion, black pepper, and olive oil for a minute, until the onion is slightly browned. Add the chicken-breast cubes, orange juice, and pineapple, stirring as you do. Once it all comes to a boil, immediately reduce the heat to medium and add the banana and maple syrup. Reduce the heat, stir, cover, and simmer for another 5 minutes. Serve as is or over a small bed of rice. Don’t you get the munchies? What do you eat? Of course I do. The key is simplicity. You just want to grab something. Here’s the healthy way. No, not the stuff that looks like ice cream. I buy containers of low-fat yogurt (caramel flavor) and throw six at a time in the freezer. When I want one, I take the lid off and pop the yogurt in the microwave for about 30 seconds. (The time will vary according to your microwave.) Enjoy. It’s as good as ice cream but better for you. My favorite midnight snack is a small bowl of cottage cheese with some whole-fruit jam mixed in. The protein in the cheese helps keep you anabolic through the night, the glutamine aids in muscle recovery, and the tryptophan will help you get a good night’s rest. And the jam just helps it go down easy. No, really. I always keep it on hand. It’s the purest food you’ll find bottled or canned. I use the fruit varieties as a postworkout simple carb to replenish my glycogen stores, but the vegetables are good as well. This is a simple postworkout snack that helps replenish glycogen stores. It’s not really tapioca, but it has the same texture. Don’t you crave burgers? I don’t eat much red meat, but I do make burgers once in a while. I buy organic lean ground beef, with no hormones or antibiotics, and make very thin patties. I wrap them separately and store them in the freezer. After thawing in the fridge, they cook in minutes. What do you eat at the movies? I bring a bottle of water and a package of ABB Steel Bar Rivets. They taste like chocolate-covered malted-milk balls but have a much better nutritional profile than anything you’re going to find at the theater: 16 grams (g) protein, 19 g carbohydrates, 8.5 g fat. They’re easy to carry along, you’ll save 15 bucks, and you’ll be able to watch the movie with a clear conscience. What about in airports? I fly a lot and see people devour a personal-size pan pizza in the terminal, then lumber onto the flight. Not me. I carry a Tri-O-Plex bar (available at drugstore.com) and a couple of pieces of fruit in my carry-on. And I always bring a bottle of water to stay hydrated. Plan ahead so you don’t cave in to the aromas in the terminal. Anything weird in your fridge? Not weird, but maybe unexpected. For instance, I’ll bake, grill, or poach boneless chicken breasts six or eight at a time. Then I’ll store them in the fridge separately, in resealable bags. That way, they’re always there to cut up into salads, onto pasta, or in a sandwich. Sometimes I’ll just grab one and eat it in the car. Do you take any supplements? Which ones, and when? I take a multivitamin, whey protein, and glutamine every day. Beyond that, I cycle supplements like creatine and coenzyme Q10. What’s cycling? It’s important, that’s what. I believe cycling enables your body to use a supplement more effectively, especially when you allow your system to recuperate between cycles. For instance, if I were going to do a cycle of creatine, I might go 3 months on and 3 months off. Cycling can be motivating. The first time I took Co Q10, I felt this amazing energy shift within the first 3 days of taking it. After several months, though, the feeling began to level off, and I decided to take a break. When I got back on, I felt that same energy shift. I’ve determined that cycling my Co Q10 is most effective on an every-2-months basis. But multivitamins, whey protein, and glutamine are exceptions–I use them year-round. Are some brands of whey protein better than others? Do you have any tricks to make shakes taste better? My favorite is American Whey, Double Chocolate flavor. I buy 25 pounds at a time. Instone Intake Lean is also a great-tasting whey protein in both vanilla spice and chocolate flavors. Mixed with water, this stuff gets so thick you can’t drink it through a straw. If yours needs a flavor fix, try these recipes. In a blender, blend all the ingredients except the fat-free milk, then slowly add the milk until you produce the right consistency. Blend the soy milk, fruit, and whey protein until smooth and, if needed, slowly add a little skim milk until you reach the desired consistency. What are your key kitchen tools? An espresso grinder for my flaxseeds. Flaxseeds are an excellent source of fiber, and they’re rich in omega-3 fatty acids. You can buy preground flaxseeds at a decent price, but in the long run, it’s much cheaper to grind your own. I grind a week’s worth at a time and store them in the fridge. A bamboo steamer for steamed vegetables, chicken, and fish. I’ve used one since college. I put chicken or fish on the bottom level, then longer-cooking vegetables on the next level, and the quickest-cooking vegetables on top. All you do is place the steamer over a pot of boiling water and sprinkle in some salt-free lemon pepper. This way you have a complete meal in minutes. A hand mixer for blending smoothies. I don’t use it every time I mix a whey-protein shake, but it’s a great, inexpensive tool. Do you drink? What’ll you have? I don’t drink alcohol very often, but when I do, I like a nice glass of red wine. Too much alcohol can deplete your body’s calcium, as well as potassium and magnesium–all-important nutrients for building muscle and staying lean. You are currently browsing the "Impossible is Nothing!" - adidas blog archives for September, 2006.